This is a brief first report-back which will be updated presently with a more comprehensive one, along with more photographs. The CTARC's 70th Anniversary celebratory luncheon was a great success! 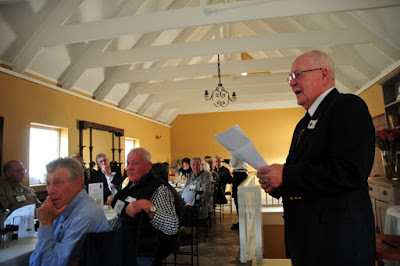 Members past and present met at the Wild Fig Restaurant in Mowbray from 12h00 on Saturday 25 June. We had the chance to enjoy a flute of champagne in the downstairs bar while waiting for all the guests to arrive. At around 12h45 we moved upstairs into the function room which had been beautifully laid out in preparation for the event. Once the guests were settled, Danny / ZS1BL as Master of Ceremonies introduced us to the programme and to our chairman, Rob / ZS1SA. On a projector screen in the background, a presentation (weeks in the making!) by Rob & Anne ran continuously, showing photographs highlighting the history of our club from its founding in 1946. Rob formally welcomed us to the event and started the meeting with the sad news of the passing of Tippy Marais / ZS1CL /sk. A brief moment of silence was held in his memory. Rob then gave us a concise history of the CTARC (in its numerous manifestations and localities) up to the present day. The first course was then served. We were then served the Main Course (where we had a choice of three different options). Towards the end of this, Tony / ZS1TK presented Anne with a beautiful bouquet of flowers for all her efforts and then, being the perfect gentleman, a bouquet for his dear XYL, too. Later on, the delicious dessert (Malva pudding) appeared before each one of us. The afternoon concluded at around 16h30. As guests departed, they were each presented with a commemorative certificate of attendance. Some of us stayed on for coffee at the downstairs patio until around 17h00. All the others involved, in various capacities. Our next meeting will be the important Annual General Meeting, to be held in July. Details will be published in due course. There will be a meeting for members of the CTARC committee, at 19h00 on Monday, 20 June 2016, at the CTARC Clubhouse. 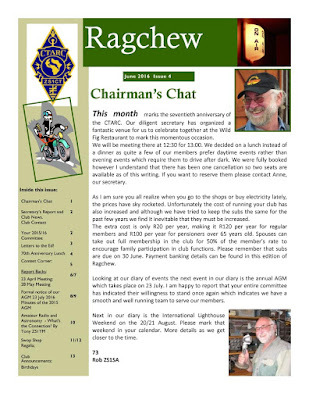 The June 2016 edition of the Cape Town Amateur Radio Centre's bi-monthly newsletter "Ragchew" has been published. Grateful thanks to club secretary Anne for yet another fine edition! 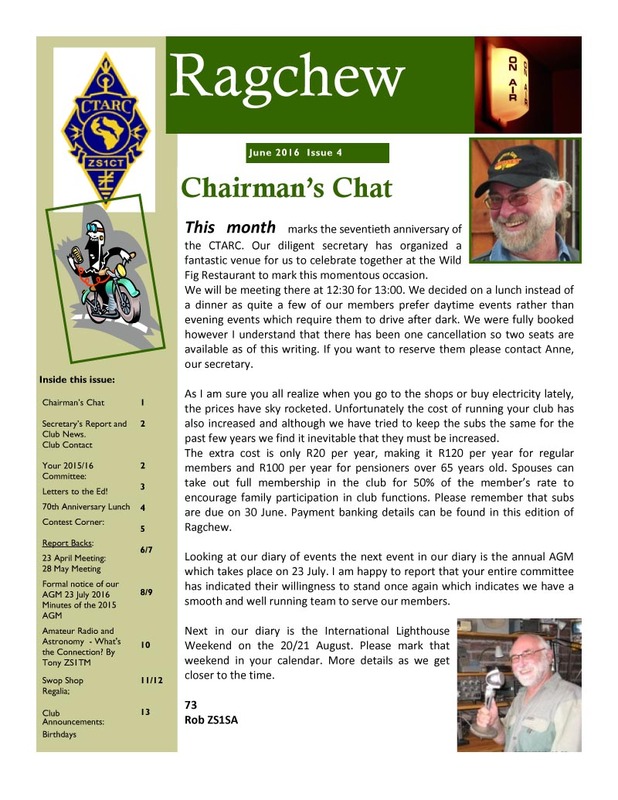 You can download the June Newsletter as a PDF directly from [here].